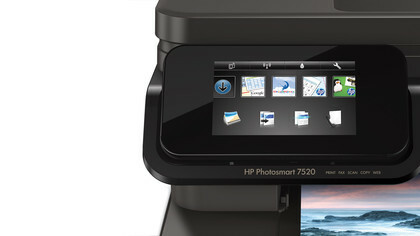 Although part of HP’s image-orientated Photosmart range, the HP 7520 is a very capable home office all-in-one printer. It has fax facilities alongside the expected printing, scanning and photocopying. There’s a 25-sheet document feeder for the scanner, a meaty 125-sheet paper tray and a 20-sheet tray for photo paper (up to 5 x 7 inches). It can both print and scan in Duplex too. On the downside, there’s no second A4 (US letter) sized paper tray and the scanner lid has fixed hinges so they can’t stretch to accommodate thicker materials. But even so, the multifunction printer is comfortably good enough to service a home or small office. 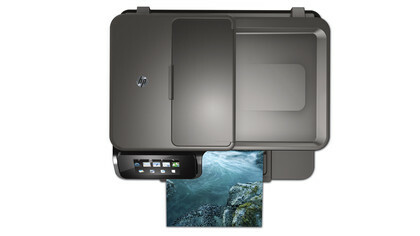 Is the distinction between HP’s Officejet and Photosmart printer ranges becoming blurred? The HP Photosmart 7520 connects to your network through Wi-Fi or directly through USB; there’s no Ethernet option. 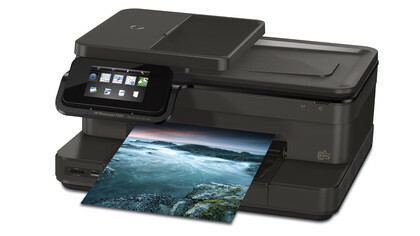 HP ePrint enables you to email documents to your printer from internet-connected smartphones, tablets and computers, and it’s AirPrint-capable for printing from Apple devices. Wireless direct printing enables you to make a Wi-Fi connection without a network, and it’s also Google Cloud Print-ready. Its inkjet system uses five tanks: cyan, magenta, yellow and black, with a second black tank with pigment ink for high-quality text printing. 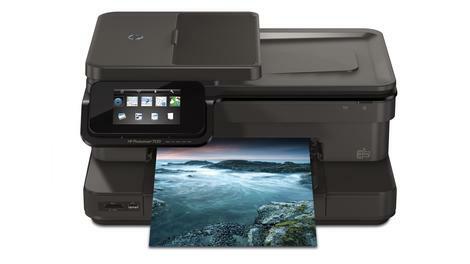 The HP Photosmart 7520 is easy to set up and use. Its 10.9cm (4.29-inch) colour touchscreen puts all its functions at your fingertips, and you can view video guides for maintenance tasks such as clearing a paper jam or replacing spent ink cartridges. Wi-Fi set-up is simple too – you’ll be connected to your network in no time. The touchscreen is very responsive, but not so twitchy that you will press buttons by accident simply by brushing against them. Unfortunately, it can be fickle when scrolling through the row of downloaded print applications atop the screen, but its basic function buttons work well. Overall build quality is very good. It’s solid and robust, with meaty paper trays and a solid ADF for the scanner. It has a couple of weak points, though. The hinges for the scanner lid don’t stretch or telescope for when scanning something thick and meaty, which is a surprising oversight considering how much effort has been made in bringing small-office features to the printer. Also, the catch tray that holds your printouts is little more than a sliver of plastic that has to be manually extended before printing. 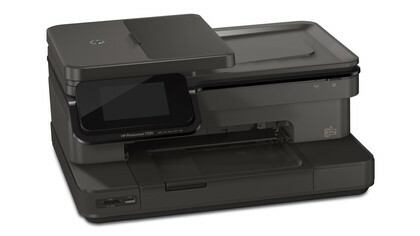 The HP Photosmart 7520 is priced £179/US$149.99/AU$269, putting it in the same sort of price bracket as the HP Officejet 150 Mobile, Canon Pixma MG6350 and Brother MFC-J4510DW. Print quality is little short of stellar. Text printing is clear and solid, with well defined characters and very little bleed. Maybe it’s not quite as strikingly vivid as a Canon or an HP Officejet, but it’s so close to perfect this hardly matters. Text remains readable even at very low point sizes too. As well as being clear, text printing is also speedy. Our 20-page test document was delivered in a shade under two minutes, which isn’t much slower than you’d expect from a HP Officejet. There wasn’t a hint of smudging or streaking either. Traditionally it’s office printers that excel at text printing, but this photo-orientated model puts in a very credible performance. This is yet more evidence that the distinction between HP’s Officejet and Photosmart range is becoming redundant. Printing our photo test image on A4 (US letter) sized photo paper at the highest quality setting gave us lab-quality results. With near-perfect skin tones and vibrant, vivid colours, the standard of the printout really shone through. The greyscale ramp was almost faultless, with no speckling, no green tinge and only the barest hint of banding. Speed-wise, the maximum dpi, A4 photo paper printing took just over six minutes to print out; unremarkable, but entirely acceptable. Printing the same test image onto plain paper gave very good if slightly imperfect results. Although colours were once again consistent and well realised, there was a little banding evident. Yet the imperfections were very small, and, when printing on plain paper at the default setting, inevitable. No printer’s output is blemish-free in this respect, and the HP Photosmart 7250 stands up well against its rivals. 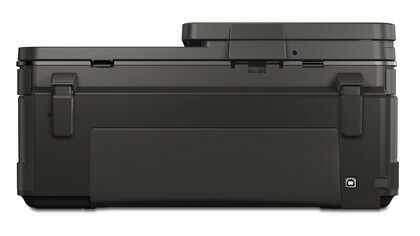 As you’d expect for a modern HP inkjet printer, the HP Photosmart 7250 has auto Duplex – you can print on both sides of the paper without turning the first printout over and putting it back in the paper tray. Once more the quality is extremely good, with our test sheet reproduced with clear text and solid, consistent colours. There was very little speckling, though using standard 80gsm paper, there was inevitably a little bleed-through. It performed admirably as a scanner too, and also did a fine job of photocopying a magazine cover. There was a little banding in areas of strong, solid colours, but again, this is inevitable, and the HP Photosmart 7520’s photocopying compares very well to its rivals. 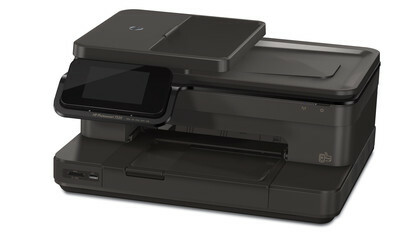 For mobile printing, the Photosmart 7520 is AirPrint-compatible for printing directly from iOS devices that are on the same network. HP ePrint enables you to print from any web-enabled computer, tablet or smartphone by sending an email to your printer’s unique address, and wireless direct printing enables you to connect and print wirelessly without going through your home network. It’s Google Cloud Print capable too. Finally, the printer can scan to email, memory cards and USB flash drives as well as directly to your computer, and also print from USB storage and most modern memory card formats. You can also download various print apps, giving instant access to quick forms, calendars, crosswords, colouring in for the kids and more. The HP Photosmart 7520 is a superb all-round multifunction printer, combining the stellar image printing we’ve come to expect from a Photosmart with features and qualities more commonly associated with Officejet printers, such as fax, ADF scanning, big paper tray and fast text printing. It also offers comprehensive mobile and web printing options. Photo printing is near faultless. Colours are vivid, colour ramps smooth and consistent and skin tones accurate. It does a great job of printing default-quality prints on regular paper too. Its text printing rivals an Officejet for both speed and quality, and its feature set is comprehensive. There’s very little to dislike here. Some may bemoan the lack of Ethernet connectivity, but you can connect to your network through Wi-Fi, or print wirelessly from a direct connection. The catch tray is flimsy, and not up to the build quality of the rest of the printer, and we wish the scanner lid hinges could accommodate scanning from thicker documents. HP’s Photosmart 7520 is a stellar printer for home use, but it’s also more than capable for home office and small office use. If you’re looking for a quality printer that’s great for both text and photo printing, look no further. This one’s a prince among inkjets.